Summary (from the inside flap of the book): Aaron Hartzler grew up in a home wehre he was taught that at any moment the Rapture could happen--that Jesus might come down in the twinkling of an eye and scoop Aaron and his family up to heaven. As a kid, he was thrilled by the idea that every moment of every day might be his last on earth. But as Aaron turns sixteen, he finds himself more attached to his earthly life and curious about all the things his family forsakes for the Lord. 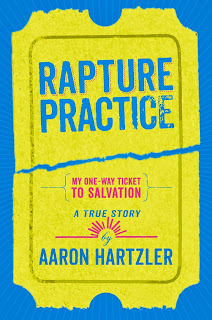 He begins to realize he doesn't want the Rapture to happen yet--not before he sees his first movie, stars in the school play, or has his first kiss. Eventually Aaron makes the plunge from conflicted do-gooder to full-fledged teen rebel. Whether he's sneaking out, making out, or playing hymns with a hangover, Aaron learns a few lessons that can't be found in the Bible. He discovers that the best friends aren't always the ones your mom and ad approve of, the girl of your dreams an just as easily be the boy of your dreams, and the tricky part about believing that no one can do it for you. Review: This book is really funny! I kept forgetting that it is a memoir because it reads like a novel. The author does point out that a memoir is his version of events, that some characters are combinations of real people and that he has created dialogue that is as close as possible to reality. But, that's all good because it makes for very entertaining and informative reading. Aaron Hartzler's family is very fundamentalist in their beliefs. I was not surprised that they didn't drink, swear, or that his dad was a preacher, but there were also no movies, no dancing, no cards, and a Bible verse for every occasion. Aaron's life was controlled by his dad (and mom to a lesser extent) who continually reminded him that every thought and every action was heard and seen by God and would contribute to whether or not Aaron ended up in heaven. The author did a really good job of showing how much he loved his family, his faith, and God throughout his childhood, but how difficult it became for him as he discovered dating, movies, and non-Christian music (even Christian rock wasn't allowed). As many teenagers do, he began to think for himself and not just accept the ideas of his church and his parents, which led to actions that were definitely not acceptable in their eyes. Aaron's struggle to reconcile his upbringing and family beliefs with what he discovers his junior and senior years in high school is tense, intense, funny, and moving. It must be so difficult to question everything you have been led to believe for sixteen years! This book ends with Aaron preparing to go off to Bible College after high school graduation. He is still questioning who he is, what he wants from life, and how to balance his faith with the secular world. I like that he didn't have all the answers, still has internal and external conflicts, and yet clings to his family and the love they all have for one another.